The Pierce Hotel was destroyed by a fire in 1881. 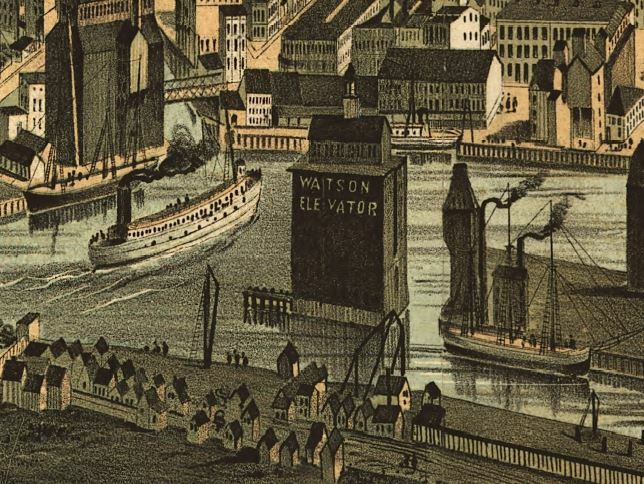 Chronicles continues a weekly look back at an illustrated map of Buffalo from 1880 and examines how the features on that map have — or haven't — changed over 138 years. Click here to explore the map. By the time he opened the “Invalids’ and Tourists’ Hotel” at Porter and Prospect avenues in 1878 on the West Side, Dr. R.V. Pierce had long run a mail order quack medicine dispensary from Buffalo and had also been elected state senator. “Chronic diseases of every sort will be treated in the sanitarium,” reported The New York Times. Like many of Buffalo’s grand structures of the era, it was destroyed by fire in 1881. The site is now a part of the D’Youville College campus. For many decades following, Dr. Pierce’s hotel and dispensary were on the 600 block of Main Street opposite Shea’s Buffalo. The Pierce Building still stands there.